Versatile Vinegar: The Best Product(s) You Didn't Know You Had! If you're like me, you're always looking for greener choices: economical and environmentally-friendly, when buying household items. I keep cider vinegar and white vinegar on-hand at all times. I've used white vinegar in the past to clean windows and glass. I've also used it to take the sting out of bug bites and in sitz baths. My grandmother, Mrs. Lena, used it in the laundry and in her concoction of white vinegar and an egg to condition my hair- it worked wonders! I've used cider vinegar to get relief from acid reflux flare-ups (it really works!) and also with honey to help with colds. Sometimes the simplest things are the greenest things. This series of posts will provide many wonderful and different uses of vinegar- a non-toxic, inexpensive product. Wednesday Blog Hop Is Here! Turn off the lights! Make sure you turn off the lights when you leave the room. However, if you use CFLs or fluorescent lights, to get the maximum life out of these, only turn off the lights when leaving the room for 15 minutes or more. Control the temperature. A recent report from the United States Department of Energy (DOE), announced electricity rates will jump more than 10 percent this winter - the largest spike in 25 years. Try lowering your thermostat. 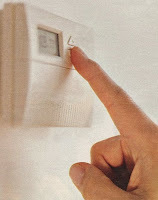 The Alliance to Save Energy claims that lowering the thermostat by even one degree can save 3% on your heating bill. As part of Auntie Litter’s 3rd Annual Take Pride Statewide Conference, 2010 Alabama Gubernatorial Candidates, Dr. Robert Bentley and Commissioner Ron Sparks will speak at the Leslie Stephen Wright Center at Samford University on August 19 at 8:00 a.m. The session is free and open to the public. Both candidates will address their position on protecting Alabama’s natural environment and stimulate conference attendees to tackle issues in their respective communities. Attendance to the Keynote Speakers session on August 19 is free. Please pass this invitation to your family, friends, and associates. For more information go to www.TakePrideStatewide.org. Life the Green Way Featured on Fox 6's Power to Save! Okay, you know what day it is.....or if you're like me, you have to actually think about it for a minute. It's Tuesday! It's time for the Green Blog Hop! I enjoy the Green Blog Hop because I find "new-to-me" interesting green blogs each time. Please join me and explore other green blogs! The Wild & Scenic Environmental Film Festival Comes to Birmingham! The Wild & Scenic Environmental Film Festival is going on tour and the Alabama Rivers Alliance and the Alabama Environmental Councilare hosting the festival at The Harbert Center on August 19, 2010. This is the largest environmental film festival in North America and it's a lot more exciting that just old-fashioned "nature" videos. The goal of Wild & Scenic is to showcase the Earth’s beauty, the challenges facing our planet, and the work that individuals and communities are doing to protect their environment. This year we've got films about school kids who are changing the world, young activists fighting for social and environmental justice, the adventures of a conservation photography team, how to save the save the planet one bite at a time, and more. Life the Green Way is a proud promotional sponsor of this event. For tickets and more details visit www.alabamarivers.org. It's Time To Blog Hop! The Green Blog Hop is a "must-do" for all bloggers, especially newcomers! My first hop was last week and I found a lot of witty and talented bloggers that I may never have found without doing the "hop." Join me as I continue on this awesome journey and discover some kindred spirits along the way!